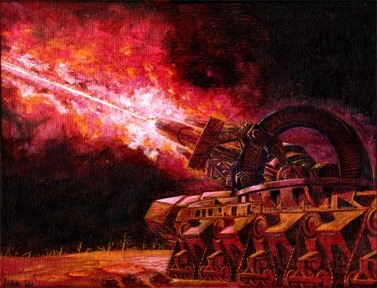 "The Big Gun," a portfolio piece of an enormous laser cannon. I wanted to show new art at Interaction, the worldcon in Scotland ("the big show", as it were), but I really needed one more painting to fill out my exhibit. But I ran out of time. So... This painting was begun in the airport lounge at JFK on the way from home (San Francisco bay area) to Glasgow. After two sleepless days and nights, working on this in the convention bar/lounge, it was ready for presentation when the con art show opened. The tiny people and vehicles at the bottom show just how big this laser tank is. I don't get as much of a chance to do hardware as I'd like, so I decided to do this portfolio piece for fun. The laser pivots on the semi-circular arch; it also swivels on a lazy Susan. It is designed to shoot down satellites and attacking starships. Also, the main cannon's barrel is wider than might appear necessary because of the surrounding cooling sleeve to save the laser's collimating (focusing) rings from thermal deformation. On long-term loan to S. Vietz, California.